A highly respected scholar and public intellectual, the Rev. 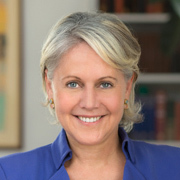 Dr. Serene Jones is the 16th President of the historic Union Theological Seminary in the City of New York. The first woman to head the 180-year-old institution, Jones occupies the Johnston Family Chair for Religion and Democracy. She is also currently the President of the American Academy of Religion, which annually hosts the world’s largest gathering of scholars of religion. Jones came to Union after seventeen years at Yale University, where she was the Titus Street Professor of Theology at the Divinity School, and Chair of the University’s Program in Women, Gender and Sexuality Studies. She is the author of several books including Trauma and Grace, Jones, a popular public speaker, is sought by media to comment on major issues impacting society because of her deep grounding in theology, politics, women’s studies, economics, history, and ethics.